But just don't just take my word for it, you can see the fruits of their design success by how they won the furniture category in the German Design Award 2016 with their fantastic storage range "Stack". Its clear design and versatile combinations and configuration possibilities convinced the judges to make the system the winner. 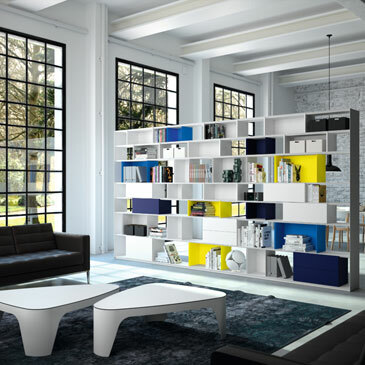 And what a fun range it is to specify as well, whether using it as a room divider, multi use storage system, or both! With the different finish options, specification options and colour variations there are a feast of options. But Muller are far from a one trick pony. Their products are manufactured from steel and they produce all their furniture using traditional procedures. After cutting, pressing and stamping, the steel plate for each piece of furniture is welded by hand. For the varnish they use an acrylic varnish from the car industry giving high shine surfaces that are both hard wearing and easy care. The furniture ranges are available in all RAL colours giving maximum diversity to your finish options. Our other favourite ranges from Muller would have to be the Highline benches and reception desks, the Workspace desk system and the Modular credenza. The highline reception desks give us some great solutions to reception desk requirements and the linoleum desk top option gives a great aesthetic finish to a beautiful desk with crisp clean lines....in any colour you like! The Workspace desk system gives a unique solution to height adjustable desking. Either mechanical or electronic height adjustability with an intelligent cable management system gives the range incredible funtional attributes to accompany flexible aesthetics with its specification and finish options. And now the Modular credenza range. I can't tell you how many times I have been trying to source a particular sized unit for a meeting room that has to be in a certain colour. With two heights, four widths, a variety of doors, flaps, drawers and compartment options and any RAL colour or the Oak finish, the Modular credenza range is solving many problems.